I have a problem. I've become addicted to lavender and lilac polishes. I only have 3 or 4 of these colors, but I want more. I just love this shade of purple. 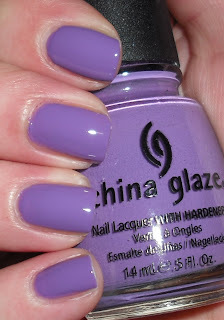 This China Glaze is one of my favorites in this color family. Spontaneous is a medium lavender creme. Do you have any favorite lavender or lilac cremes/shimmers/ or glitters you would like to recommend? P.S. : My friend over at Lacquer Ware for Tips and Toes is having a blogsale! She has some great international lacquers she is selling! This is a great color! My fav is Catrice - Lucky in Lilac or OPI - A Grape fit. :) Almost the same but I love them both. Sally Hansen's Insta Dri Lively Lilac is great. I think it looks great on a variety of skintones. Oh, I love this! I'm a whore for purple polishes in any shade and tone. I personally love Essie's Lilacism and OPI's Rumple's Wiggin'.. also, Sally Hansen's Lively Lilac! Spontaneous is my all time favorite color.I just adore it.I too love these colors. Not sure if it is totally a lavender, but I love Wet n Wild "Shameless" and OPI "Done Out in Deco" (pretty light) and of course Zoya's new Spring color "Marley." They are all pretty light though, especially compared to Spntaneous, which is gorgeous, might I add. I have Spontaneous and I have not tried the color yet lol. I'm hoping to try the color out soon. Wow, such a gorgeous color! I love these types of purples. I'm just starting to love these colors. I don't have any suggestions. Pretty swatch! Thanks for sharing. I am a three headed freak for soft lilacs/ lavenders/ purples! Do u have Essence Color and Go "No more Drama"? I have a feeling you would loooove it! And sounds like u need Zoya's Marley too. Spontaneous= the shiz and looks beautiful on you. Thank you all for your suggestions! I just picked up Essie Lilacism and SH Lively Lilac per your suggestions. I'll be checking out your other recs too. I appreciate it! Very pretty...Did it take only one coat to get the results in the photo?